JOTUNHEIMEN TOUR 6 stages . 7 nights . Jotunheimen Sounds perfect? View our trip! 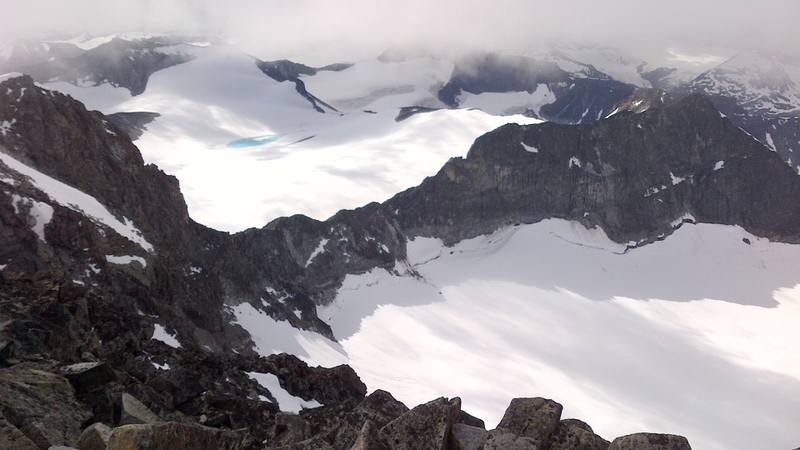 We are thrilled to introduce our first Norwegian trekking area, the Jotunheimen. We apply our explorations to this exciting, wild, area with the hope of showing it to our Alpine trekkers. Of course Norway is well known for its Winter sports but in Summer, as the snow melts, Norwegian families return year after year to walking in the outdoors. As you'll experience, trekking and the outdoors form an absolute part of the Norwegian cultural soul. The Norwegian approach is orderly with a time-honoured reverence to preserving their natural spaces and maintaining the national parks for the next generation. You will meet Norwegian walkers of all ages with their families, even meeting three generations together is common. With so few foreign walkers it's easy to feel warmly adopted into this lifestyle. The hut system is possibly our favourite out of any nation and really typifies the Norwegian experience. A stay in one is a glimpse into the small things which form the culture, for example in hot or cold weather it is expected that you will be trekking with a thermos flask, as is the Norwegian way, so in the evening all guests line up their flasks, labeled with name and hot beverage of choice and miraculously come breakfast they are full and ready to provide sustenance for a day on the hills. Food in the huts is chiefly Norwegian, with all that can be grown in Norway if not the local region. Hearty mountain food is found for dinner as you might expect! A touch we appreciate is that lunch is made at the breakfast table from the excellent breakfast spread. Expect Norwegian cheeses, cured reindeer sausages, robust home-made seeded bread, a whole section of the buffet dedicated to pickled fish and vegetables as well as more conventional choices. Meals are communal and an excellent opportunity to dine and chat with local trekkers (who will undoubtedly have impeccable English). You'll have to tear yourself away to bed early or risk a spirited night of beer and cards. The huts are normally family-run, often having spent generations in the same family. You'll notice the feel of the huts reflects the character of the owners. Some huts are independent, however many are a part of the DNT which is the national trekking association tasked with the duty of maintaining the walking routes and signage. You'll become very familiar with the DNT logo by the time you leave. The red 'T' flash painted on rocks will become a welcome reminder that you haven't strayed off course! Anyone on one of our trips of 5 nights or more will become a DNT member for the year which can be handy if you'll be doing any more walking in Norway before or after the Jotunheim as it gives you discounts towards your lodging. To describe the Jotunheim is a little tricky without making comparisons so do forgive any! The landscape is quite rounded without the sorts of steep, relentless ascents and descents that are found in the Alps. On paper the day might not look that hard with elevation gain and loss in the hundreds of metres rather than thousands and most days comfortably under 20km. It's the terrain that provides the challenge. In fact this means that the days are quite balanced, a shorter day but trickier underfoot! The harsh snow-melt cycle means boulderfields are common, snow patches are also found which may seem a little daunting at first but are easily crossed in walking boots. The trekking months of July and August are of course when much of the snowmelt is in full swing so the valleys run with small streams which are comfortably crossed with care. Well-made bridges are there for the larger crossings. The valleys are wide, huge in fact, which adds to the sense of barren isolation that the days bring. It is similar to the Scottish Cairngorms. Once you lose sight of the morning's hut you won't see another dwelling or cultivated land until you arrive at your destination for the night, the waymarkers and friendly greetings of ‘got tur' from those passing in the other direction being the only signs of civilisation. In a sense it's refreshingly unlike the Alps which typically passes through pastoral farmland, villages, and huts catering to the lunch trade. You should be prepared for all weathers in the Jotunheim, Summers are generally warm but similar to Scotland in that rain could fall at any time. The park shares its latitude with Canada's Yukon or mid-Russia which might help put it into context. The benefit of course is the long hours of sunlight! In July and August the sun has well and truly risen by 5am and will set at about 10pm. What a great luxury not to be concerned with daylight hours! Dinner is normally served in two sittings at around 6.30pm and 8pm thus a relaxing day is certainly possible. The DNT, Den Norske Turistforening, is the Norwegian trekking and travel association. The DNT runs many mountain huts and maintains information offices in Norwegian towns. We include the year's DNT membership for Norway treks of 5 days or more. The starting point of the walk is easily reached from the cities of Bergen and Oslo. Our notes contain all the details to make the journey with confidence by bus or train but to give you an idea, it's about 5 hours' by coach from Oslo, and about 7 by train from Bergen. The buses and trains will likely be filled with Norwegians of all ages escaping the city on their way to adventure in the hills. Both Oslo and Bergen make superb stops before or after the trek. We've visited fairly frequently both through the pursuit of research so we've amassed some suggestions we hope you'll enjoy in our notes. The accommodation on the trip is mainly hut-based starting at the cosy and grande Gjendesheim hut which sits on the road-head where you'll arrive from Bergen or Oslo. The huts on the trip have the option for either private rooms or dormitory places. We can book either, whichever you prefer. The dorms are generally wooden bunkrooms of a high standard. The egalitarian nature of Norwegian society and the welcoming character of mountain culture means that no one is ever turned away from the hut. There's a chance you may find it a lot busier than expected which we hope you'll take as all part of the experience! The routine of the hut life is similar to the Alps; walkers will begin to arrive between about 4 to 7 pm. The showers run hot, not limited by the supplies of the Alpine solar heaters! It's a nice chance to relax with a drink of local craft beer until dinner. You'll find homely spaces to enjoy into the evening. Norwegians enjoy a leisurely start to the day, after all there's all the daylight you could desire. Breakfast is eaten about 8am with a view to setting off around 9.30. Rather civilised! The DNT's superb network of paths and our logistics mean that trips of anything between 3-8 days are an excellent option. The full 8 stage trip takes in a circuit that encompasses almost the entire breadth and height of the park. You'll find that the stages contrast greatly as the landscape in the Johunheimen is swift to change from lush valley to barren boulderfields to lake-side paths. Shorter trips work well and can be aided by the ferry which runs between Gjendesheim, Memurubu, and Gjendebu. The path from Leirvassbu to Gjendebu is a handy link between the northern and southern sides of the walk which makes shorter circuits work really well. Today we strike out North towards the Glitterheim hut following the river and Lake Russvatnet. It's a relaxing day and a good warmup to the snowy ascent of Glittertind that is to come tomorrow. The day begins with a steep climb up from the Gjende lake. The morning view at the top is well worth it. The path then passes into a wide valley with the narrow lake running along the bottom. The route follows the sandy shore on easy ground before rising away from the lake. The ascent is steady before becoming rockier with some snow patches at the high point of the day. The Glitterheim hut is visible a long way off but the gentle descent must be taken steadily as large rocks lie underfoot: an introduction to the sort of terrain that will be found frequently in days to come. You'll find this day much quieter than yesterday's as we leave the day-trippers behind. Glitterheim is a delightful hut with a cosy living room to enjoy after the long day. This is a superb day, a summit of Norway's second highest mountain (by 4 metres), Glittertind. Glittertind had been the highest until its glaciated peak melted too much and it was dethroned by its close neighbour, Galdhøpiggen. The walk is perfectly possible in walking boots as the glacier has a good covering of snow, although there is a gentler lower route in case of poor weather. As you ascend from Glitterheim you'll pass through snow patches of increasing frequency until the snowfield proper is reached. After about two hours of ascent, the rounded summit is reached and spectacular views await! The path is safe in fair weather and well traveled; however, you should avoid getting too close to the unsupported snow cornices to the North of the path. The descent to Spiterstulen hut is rocky but rewarding with some steep but easy scrambling required. There are one of two tricky sections but the only real danger would be rushing. It's a challenging day but rather exciting to walk through the snow at such low altitude in the middle of Summer. Spiterstulen hut definitely has the biggest breakfast selection on the route so factor that into your morning timings! Today is is a welcome break after yesterday's efforts. A walk through vast sweeping valleys with snowmelt running off the steep mountains lining either side. Some careful rockhopping will be required today as we cross quite a few streams but a slip wouldn't prove too disastrous with water at about ankle height. After a long and very gentle descent the valley opens out as the path follows the rocky shore of a series of lakes. Leirvassbu sits on the far shore of the final lake. Leirvassbu is a true gastronomic hut with an excellent three course dinner! A short, stiff climb leads to a pass and the revelation of the long valley ahead. Pass the turning to Olavsbu and an isolated hut on a promontory in the lake. Before the final valley descent to Gjendebu, at the head of its lake, we drop beside a huge waterfall. Steep rocky paths guard a plateau at either end, especially steep on the way up from the shore of lake Gjende and helped by chains. The middle section of the day gives high and wild views to the North. Arrive at Memurubu in a grassy setting by the shore. The last day to Gjendesheim is a fairly tough one with some tricky bits of terrain. Despite being one of the iconic images of Norwegian tourism, the Besseggen Ridge is a quieter route than you might be led to believe. It truly is beautiful although there is the option of the ferry direct to Gjendesheim or a lake-side path if you prefer an easier option. Some scrambling is required on the ridge itself although, with care, it's no obstacle. Much of the day is rocky underfoot, some without a well defined path but always well marked with protruding cairns. After a descent down to the eastern tip of the Gjende lake you reach the large Gjendesheim hut. Enjoy a final hut night or take the bus to the town of Otta. A day through the wilder western half of the park, the path ascends from the valley onto a barren height plateau where a rocky valley leads to the beautiful pair of mountain lakes, Urdalsvatnet and Kvitevatnet before descending down the course of the valley to Fondsbu. Galdhopiggen (2,469m) is the highest point in Norway and indeed the Nordic region. This optional day's walk is an out-and-back ascent from Spiterstulen. It is within the walker's realm but crosses extensive snow patches near the summit, even in high summer. These are marked by twigs and sometimes waymarks. Depending on conditions, there could be snow-covered ridges and boulders too. It is a popular path and an achievable summit for strong walkers. The summit view is exceptional, of snow-filled corries with turquoise tarns. A small manned hut at the summit serves coffee, snacks and souvenirs. Galdhopiggen is something of a pilgrimage for Norwegians and you will see many more walkers coming from the Juvashytta glacier route to the North, the two routes meeting at the summit. A second route up Galdhopiggen is from the Juvashytta. This crosses the glacier and is offered, for those who don't have their own kit for glacier travel, as a guided walk from the Juvashytta. Groups leave the hut roughly 2 times each day of Summer. It would be easiest to stay at the Juvashytta for at least the night before, and we recommend taking a day to reach the Juvashytta from Spiterstulen, by bus. Please ask us if you'd like to add this either side of your trek, or make space in your itinerary at Spiterstulen. Alpine Exploratory offers two self-guided options - long or short - plus a guided trip. We're also pleased to book shorter or longer sub-sections of the route according to your available dates. Please contact us to discuss options. Our self-guided holidays give you what you need to complete the route under your own steam. We book your accommodation in a mix of huts and hotels and we give you our detailed routecards, the local maps, and lots of notes. Importantly we will advise on the ideal schedule and accommodation to suit your approach to the Jotunheim. Our guided trip is similar but gives you the benefit of an Alpine Exploratory leader to show the way.